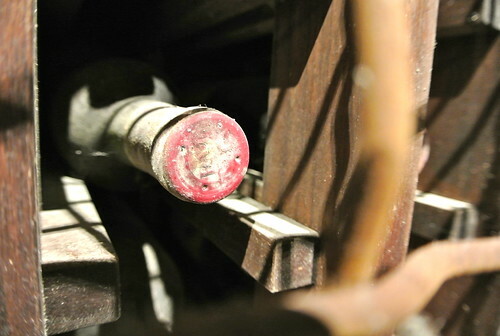 With the Vintages Finest and Rarest Wines Auction coming up this Friday and Saturday in Toronto it is a good time to discuss why we age our wines and what compels so many to spend so much on dusty old bottles of wine. One of the highlights of the Vintages auction is a complete vertical of Chateau Mouton Rothschild from 1945 to 2001. The estimate for the 56 bottles in $55,000 to $65,000, but I suspect it will fetch much more than that. Someone very rich and very obsessed with older wines will purchase the lot and have one hell of a dinner sometime down the road. The auction features the finest wines in the world from the top regions in the world including Bordeaux, Burgundy, Champagne, Italy, Australia, Napa Valley and Spain along with fine and rare spirits. I suspect one of the most exciting lots will be the 1945 Chateau Haut-Brion with a starting bid of $16,200 for a six-bottle lot. Or, perhaps, two bottles of 1913 Hennessy Cognac bottled in 1953 to celebrate the coronation of Britain’s Queen Elizabeth II, starting bid of $2,300 each, is more to your taste? While there’s no doubt many of the wines and spirits will be delightful, whether it’s worth it depends entirely on your bank account. The event features two live bidding sessions. The first takes place on Friday in the Grand Ballroom of the Trump International Hotel & Tower following a pre-auction dinner at the hotel. Bidding begins at 8 p.m. The second phase of the auction takes place at Waddington’s Auction House on Saturday starting at 10 a.m. and lasting until bidding closes. Both live auctions are free and open to the public. In all, more than1,400 lots of rare wines valued between $1.8 and $2.4 million will be offered for bidding. Each lot can be viewed here where customers can also register for the sale and bid live during the auction. Catalogues are available at the auction or as a download here. I simply love older wines and will be there in Toronto to try and buy the smaller lot, off-vintage treasures that I think I can afford. But I will not buy these wines at any cost. I will look for those wines the serious collectors will pass on because they just aren’t impressive enough for their vast and impressive cellars. 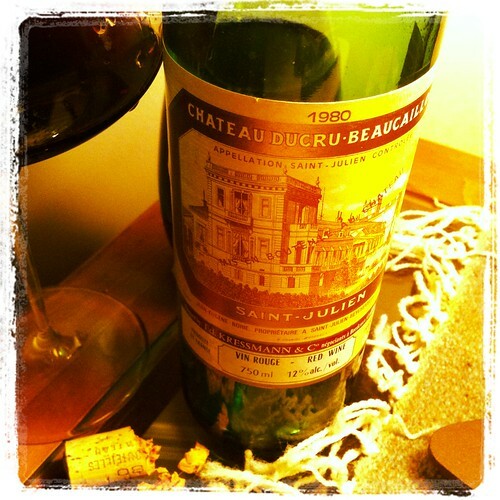 I buy older wines to drink older wines, not to fawn over and never to impress people. Buying and holding good wine is a perilous adventure. Those who choose to cellar their prized treasures always run the risk of waiting too long, or hanging on to a wine that never really had a chance. For those of us who collect wine to drink as it ages, the rewards can be extraordinary and well worth the risk. A perfectly cellared bottle of wine develops such extraordinary nuances and flavours as it ages. Tannins and acidity soften, fruit integrates with the oak, and wonderful tertiary notes emerge that can only develop with age. Not all wines age gracefully, of course, but when you find the styles that do well over time, the experience can be ethereal. I have recently opened several older bottles of wines all with unique charms and not one of them a disappointment. The Beaulieu Vineyard Georges de Latour Private Reserve 1997, Chateau La Dominique St. Emilion Grand Cru 1990, Penfolds Cabernet Sauvignon Bin 707 1998, and even the Chateau Ducru-Beaucaillou Saint-Julien 1980, an off-vintage Bordeaux, were all extraordinary wines and delivered immense pleasure in that charming old-wine way. Part of the pleasure is knowing that most of those wines were stored and carted around from home to home for many years. The anticipation and choosing the right moment to drink them is enthralling and a big part of why we do it. I am finding more and more that collecting and enjoying wine isn’t confined to the great and historic regions of the world. Ontario with its searing natural acidity and aging vines, is starting to show its staying power. In fact, the top Bordeaux blends, Rieslings, Chardonnays, Syrahs and Pinot Noirs, show much more personality with some aging. Trouble is, few people are putting these wines down in the cellar to watch them progress. And, very few wineries have older vintages available for sale in their retail stores. It will be some time before Canadian wines share the pages of Vintages’ Finest and Rarest Wines Auction beyond the single half bottle of Inniskillin Icewine 1989 that’s wedged between a lot of Saxum James Berry Vineyard 2010 and Perrot Minot Chambolle Musigny La Combe d’Orveau 2006. But it will happen. Ontario wines have unlimited potential. We are starting to see some older vintages appear in retail stores in Niagara and beyond. Daniel Lenko in Beamsville just renovated his retail shop and he’s filled it with older vintages of his age-worthy Chardonnays, Pinots, Viogniers, Rieslings and Cabernet Francs. I had a sip of his 1999 Pinot and it was extraordinary and I suspect his Old Vine Chardonnays and Cab Francs would also be remarkable. I also opened Fielding Estate’s Chosen Few Red 2007 recently. This is a wine that raised a few eyebrows when it was released at $75 a bottle, but after drinking it six years after the vintage you might wonder why you didn’t buy more. It was lush, complex and thrilling. Other older Ontario wines I have opened lately include Hidden Bench Tete de Cuvee Chardonnay 2008, Le Clos Jordanne Les Clos Jordanne Vineyard 2007 Pinot Noir (in magnum), and Rosehall Run Rosehall Vineyard Pinot Noir 2008. All were delicious and the age had added a new dimension to the taste profile. They are better wines today than they were on release. And then there’s Vineland Estate. Winemaker Brian Schmidt shows more of his older bottlings than anyone else in Niagara. The retail shop has a vintage corner that sells aged wines at all levels. Schmidt likes to show off his Rieslings in particular and has the maturity in the St. Urban Vineyard to provide increased ageability and complexity with each passing vintage. I was blown away buy a recent tasting of the Vineland Estate Elevation Riesling 2007 with its sweet petrol and lanolin to go with citrus zest, tangerine and peach notes. The sweetness was perfectly balanced by racy acidity and showed profound minerality and still a bit of freshness. 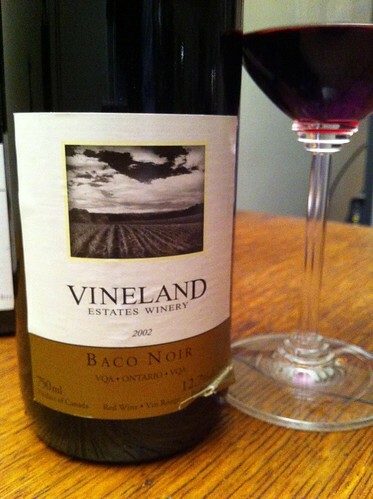 I also tasted a 2002 Baco Noir from Vineland. This isn’t my favourite variety but I loved how this aged. It had a savoury nose with leather, tobacco, blackberry, currants and well-integrated spices. It sill had some stuffing on the palate with ripe, but maturing fruit and a smooth delivery. 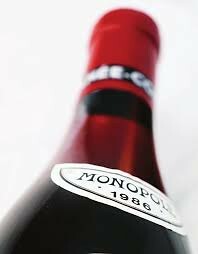 My suggestion to you is to look for wines in the best vintages and put some aside for a while and forget about them. I think you will like what you taste. Some new releases I’ve enjoyed recently. Chateau des Charmes Barrel Fermented Chardonnay 2011 ($14, LCBO, winery, 88 points) — A nose of fresh apples and pears with a lovely kiss of butterscotch cream and spice. There’s a lot to like in this affordable Chard from the poached pear and pineapple fruit on the palate to the vanilla toast and creamy toffee notes. A beam of racy acidity keeps everything fresh and lively through the finish. Lakeview Cellars Syrah Rose 2012 ($17, winery only, 87 points) — A nose of bright cherry and raspberry with meaty cassis and sweet strawberry accents. This is a bold offering made in a bone-dry style that’s loaded with red fruits on the palate. A year-round rose. Dan Aykroyd Discovery Series Cabernet-Shiraz 2011 ($15, LCBO, winery, 88 points) — A bold and rich nose of roasted meats, savoury cherry, blackberry, pepper, herbs and spice. It’s smooth on the palate and well balanced with blackberry, blueberry, cassis, an array of spices and delivered on a bed of ripe tannins. Good value wine. De Sousa Wine Cellars Seasons Reserve Meritage ($15, Vintages, winery, 89 points) — Another impressive wine for the price from the Diamond Estates family of wines. It’s perfectly aged and ready to drink with a nose of blackberries, currants, cherry, spice and integrated spices. It’s lovely on the palate with mellowing tannins, lovely ripe fruit and everything in balance. Inniskillin Vidal Icewine 2012 ($50 for 375 ml, LCBO, Wine Rack stores, 92 points) — There’s no question that 2012 will provide an opulent style of icewine and this one delivers in spades. The nose shows profound peach, lanolin, honey-drizzled grapefruit, apricots and tropical fruits on the nose. It is rich, dripping in honey and layered with a luxurious feel on the palate to go with concentrated peach, marmalade, tropical fruits and a subtle note of nougat that we evolve over time. Textbook icewine. 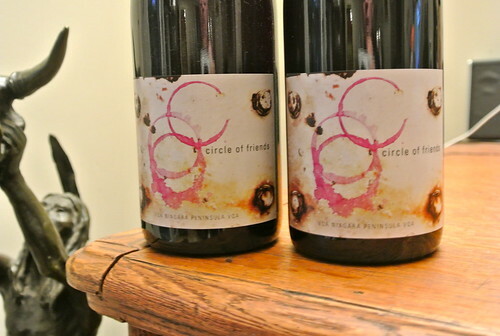 Vineland Estates Circle of Friends Re-Purposed Pinot Meunier 2012 (price NA, Wine Club members only)— Vineland Estates has one of the most active wine clubs in the business. And for good reason. The winery is constantly offering members new and exciting wines that just aren’t available at the retail store. The new Circle of Friends label features wines that were inspired by mentors and friends of the winery with each wine representing the spirit of a specific person, place or time. The “Re-Purposed” Pinot Meunier, a grape that winemaker Brian Schmidt is championing in Niagara, shows a nose of blueberries, plums, cherries, light spice and a savoury note. A bold flavour blast hits the palate with warm blueberry pie, cherry-rhubarb, light herbs and spice all presented along a clean, smooth delivery. 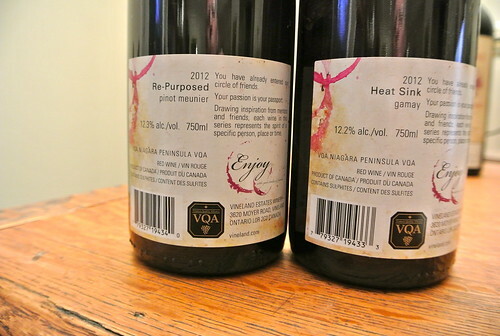 Vineland Estates Circle of Friends Heat Sink Gamay 2012 (price NA, Wine Club members only) — A Gamay that shouts “drink me!” The nose displays inviting and cheerful cherry and fruit-forward raspberry fruits that follow to the palate. It’s a smooth, delicious wine that leaves you wondering where the wine went so quickly.